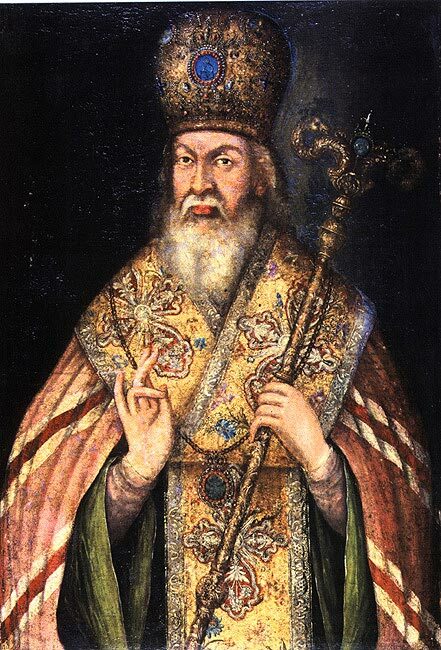 Saint Sophronius, Bishop of Irkutsk and Wonderworker of all Siberia, whose family name was Kristalevsky, was born in Malorussia in the Chernigov region in 1704. His father, Nazarius, was “a common man in his affairs,” and the Saint was named Stephen, in honor of Saint Stephen the Protomartyr. He had two brothers and a sister, Pelagia. The name of one brother was Paul. The name of the other older brother is unknown, but it is said that he was head of the Krasnogorsk Zolotonosh Monastery. Stephen’s childhood years were spent in the settlement of Berezan in the Pereyaslavl district of the Poltava governance, where the family settled after the father was discharged from service. When he came of age, Stephen entered the Kiev Theological Academy, where two other future hierarchs were studying: Joasaph, future Bishop of Belgorod (Sept. 4), and Paul, future Metropolitan of Tobolsk (June 10). After completing his religious education, Stephen entered the Krasnogorsk Transfiguration Monastery [later renamed the Protection Monastery; in 1789, it was transformed into a women’s monastery], where his elder brother already labored in asceticism. On April 23, 1730 he received monastic tonsure with the name of Sophronius, in honor of Saint Sophronios of Jerusalem (Mar. 11). In 1732, he was summoned to Kiev. There he was ordained hierodeacon, and then hieromonk in the Cathedral of Holy Wisdom. After Saint Sophronius had been a monk for two years, he became treasurer of the Zolotonosh Monastery for two years, and then Bishop Arsenius (Berlov) of the Pereyaslavl diocese sent him into the house of his archbishop, where he was steward for eight years. When Hieromonk Sophronius traveled to the Holy Synod on behalf of his bishop, they paid close attention to him. In January 1742, the Saint was transferred to the Saint Alexander Nevsky Lavra in Saint Peterburg, the foremost monastery of the capital. A year later he was appointed treasurer of the monastery, and in 1746 he was appointed as superior of the monastery. He summoned his fellow countryman, the hieromonk Sinesios (Ivanoff), a native of the city of Priluki, and made him superior of the Saint Sergius Hermitage, a dependancy of Saint Alexander Nevsky Lavra. From this time the friendship of the two ascetics, hieromonk Sophronius and hieromonk Sinesios, was strengthened by their joint pastoral effort, and they were inseparable until they died in Siberia. Foreseeing difficult service on the distant Siberian frontier, the new bishop did not immediately travel to the Irkutsk eparchy, but rather began to gather educated and spiritually experienced co-workers. During this period Saint Sophronius visited his original Krasnogorsk Monastery. At the holy places of Kiev, he also sought the blessings of the Kiev Caves Saints for his service. The constant companion of the Saint, as had been before, was the hieromonk Sinesios, sharing in his friend’s work. The spirit of his ascetic life fit in with the general uplifting of the Christian spirit in Russia after the glorification of Saint Dimitri of Rostov (Sept. 21), Theodosius of Chernigov (Sept. 9), and the uncovering of the incorrupt relics of his predecessor, Saint Innocent of Irkutsk (Feb. 9). This event inspired Saint Sophronius to greater efforts and encouraged him to ask for the help of Saint Innocent in his task of building up the diocese. 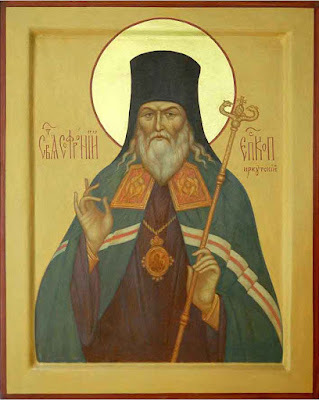 Feeling the onset of old age and deterioration in his health, Sophronius asked the Synod to dismiss him, but the search for a replacement was delayed and Saint Sophronius died in Irkutsk on March 30, 1771, on Easter Sunday. Sophronius's burial was not done immediately - for 6 months and 10 days his body was in the Kazan side-chapel of the Epiphany Cathedral in Irkutsk. On October 8, 1771, his burial took place. All this time, the body did not show signs of corruption, which was the beginning of the veneration of Sophronius as a saint. Miracles at his tomb were also recorded. In 1874, the remains of Sophronius were examined and recognized as incorruptible. April 18, 1917 in the Epiphany Cathedral, there was a fire that destroyed the tomb of Saint Sophronius. The remains of the fire were collected and reverently placed in a special casket. Saint Sophronius is also commemorated on June 30, the day he was glorified by the Russian Church in 1918. From thy youth thou hast loved Christ, O blessed Sophronios, and didst govern monastic establishments well; and being honored with hierarchal rank, thou hast kept watch over the flock of Irkutsk. Thus, after thy repose, thou hast received the gift of miracles from God, and now pray to Christ God to deliver us from misfortune, and to save our souls. Let us, O believers, extol with love the Hierarch and namesake of wisdom, the special adornment of the Church of Irkutsk, our Father Saint Sophronios, for he is the guardian of that city and country and a suppliant for our souls.